To help keep your grill in tip-top shape, we consulted the experts at Weber Grills for some easy tips to help you spring clean and fine-tune your grilling machine. 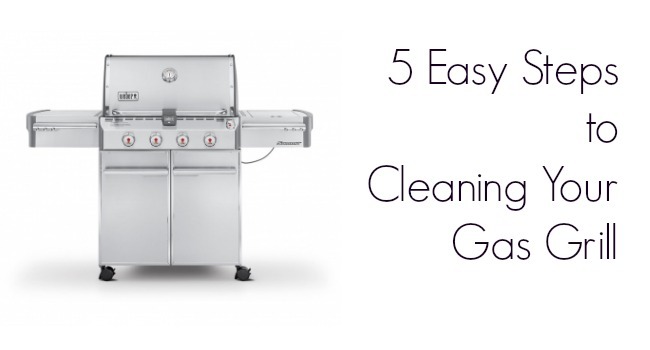 As a basic first step, grills should be cleaned before each use. Burn off any residue by turning the grill on high for about 10-15 minutes, and then brush the cooking grates with a stiff wire grill brush. A thorough cleaning and inspection of parts on the grill should be done at least once a year—and more often than that if the grill is used year-round. Inspect and clean the cooking grates, burner tubes, Flavorizer bars (or heat distribution system), warming racks, exterior elements, and grease collection tray. Be sure to check all gas fittings and hoses for leaks and replace if needed. You will need a stainless steel grill brush, fine steel wool pads, mild dish soap, a sponge or dishcloth, and a 1” plastic putty knife, all easily found at your local hardware store. Clear the burner tubes of any blockages—A blockage can be anything from spider webs or debris inside the manifolds or burner tubes that restrict gas flow and may prevent the igniter from lighting. To clean tubes, brush the portholes with a stainless steel wire brush in an up and down motion. Do not brush lengthwise across the ports, as this will only push debris from one hole to another. Clean the heat distribution system—Many grills contain heat distribution systems such as Flavorizer bars to help prevent flare-ups. To clean them, simply turn your grill on high and allow the residue to burn off. Occasionally brush the bars with a grill brush or scrape with a putty knife. Then wipe with a cloth and warm soapy water. Clean the warming racks—A soapy, fine steel wool pad will keep the warming racks and grill basket clean and free of smoke stains and debris. Rub the racks gently and then rinse thoroughly. Carefully scrape the inside of the grill with a putty knife, and push the residue through the bottom hole. Remove the bottom tray from under the grill and empty debris in a trash can. To thoroughly clean the tray, use warm soapy water and a fine steel wool pad. Make sure you also clean the catch pan and replace the liner monthly, or as needed. Clean grease drippings on exterior surfaces by using mild, soapy water. Never use an abrasive lemon-based solution or oven-cleaner as it can scratch the stainless steel or remove the paint finish. If you have a stainless steel finish, use an environmentally friendly stainless steel cleaner and a soft cloth to remove fingerprints and give it a nice shine. For porcelain enamel finishes, use a cloth and warm soapy water. While cleaning the grill, take stock of any rusted or corroded pieces. Call the manufacturer’s customer service to order parts or to locate a dealer in your area that carries original parts. Protect your grill from the elements by investing in a durable, weather-resistant cover.